Manufacturer: LAUREN Ralph Lauren Dry Goods. In Great condition no stain no hole (lightly worn). 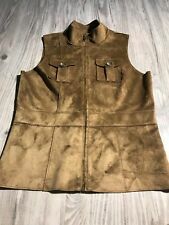 Faux Suede Sherpa Snap Vest Hooded SIZE PP. 57% Acrylic 43% Polyester (Interior Fabric). 100% Polyester (Exterior Fabric). Length: 23”. Very Good Pre-Owned Condition. Chest/Armpit to Armpit: 18”. This little jacket by INC international concepts is in excellent condition. It is fully lined and has two small front pockets. 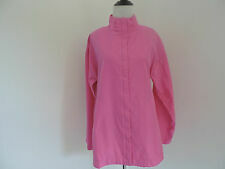 Talbots P Short Wool Coat - 28" length from collar. Perfect Condition. Detachable Faux Fur Collar. Front Slash Pockets. Fully Lined. Inside Ties. Designer: Gallery Petite. Item Size: PP. I personally inspected every Item before they go to you. Generally the last picture or pictures. Length f/Back of Collar: 37.5”. Lauren by Ralph Lauren sz P/P jacket in Black. Fun windbreaker that has ladies dress forms, mirrors, purses, high heel shoes, and flowers. Also has words written all over it, such as: gloves, dressing, shoes, hats and dressing. It has a pocket on each side, elastic waist and cuffs. This item was used as a store display model and is in excellent condition. Removable hood, two exterior front pockets, gold details. Length: 32" Bust: 34" See pics for details. Cutaway Style. 100% Polyester. Matching Button Front. 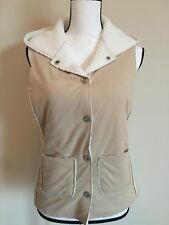 Style : Vest. Color: City Navy. Material: Shell -100% Polyester. Size : P-PT. Puffer detail on front, knit at back. Mock turtleneck, pockets at hip, zip front. Hits at hip. size - PP color - BEIGE. laying flat bust - 17". Intimates and Sleepwear. Special Details - Hooded, Full 2 Way Front Zipper, 2 Front Pockets, 3.5" Slit At Sleeves, Very Minor Wear Spot at Right Shoulder, Faux Shearling Liner & Trim. Size Type - Petite. FabulousKRISTEN BLAKE coat! Excellent condition; worn once. Purple Quilted fleece lined Vest. Size Petite P. 17 nches arm pit to arm pit. Excellent Condition.Koret Velvet Soft Women's Zip Up Long Sleeve Black Jacket Blazer. SZ PP, Petite . It has Geometric diamond shaped colored stitching throughout. Measurements are approximate laying flat, in inches - Bottom of collar to end of wrist- 26.75 Across chest underarm to underarm - 17 Top shoulder to bottom hem - 22.25 It is very black which is hard to capture in pictures, no fading. The zipper is in working order. It is lightweight . Would look great with some jeans and boots! Casual or dressy. Material - Body %90 Polyster, %10 Spandex. Lining is %100 Polyster We will ship within 2 business days of cleared payment. Thank you for looking! PATTERN Plaid. STYLE Blazer. MATERIAL Polyester. Very good condition, shows little wear! COLOR Black. LENGTH 20 in. After Dark Velvety Floral Gold Design Jacket Sz 10P. Therefore, this is not a basis for error on my part. If an item is listed as used, worn or preowned, it is just that and all defects if any will be listed. JM Collection Anorak Jacket. Color: Textured Skin Stonewall. Style Number: 61124TS477. Inventory Location:Box 125 - 706254510196. Sleeves Convertible From Long to 3/4. Very cute military style double-breasted turquoise jacket. Very Vera Stretch Denim Jacket with Embellished Embroidery Trim With Certified Insane Patch- PP - XS. 2 front pockets with flap and button closure. Length approx 22" from top of back collar to bottom of front hem. 23" length, shoulder to hem. Excellent gently preowned condition. No stains, holes or tears. SOLID BLACK. EXCELLENT USED CONDITIONS. GREAT STYLE AND DESIGN! NICE, THICK MATERIAL! 36" bust - 30" length - 23" sleeve. SNAP BUTTONS UP THE FRONT. LINING 100% NYLON. The first photo shows the jacket with and without the sleeves. chest/underarm to underarm: 20".